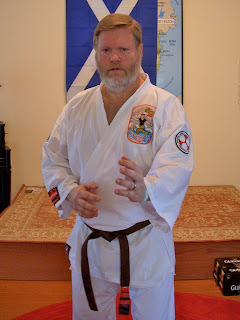 I demonstrated Kusanku Kata for Kioshi Dave Joslin tonight. I believe this is the primary requirement for Ikkyu (3 red stripes on the brown belt). I need to be mindful of the rear foot position after any spinning moves. Kusanku has fast and slow sections; the fast parts need to be faster. Sharon video taped me doing the six Isshinryu kata. It went well so these will show me at my best to date. Next week is the hip surgery so I get to begin again. 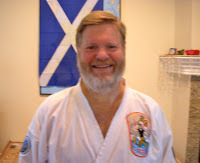 Sensei Shawl reminded me that one should focus on the attackers with intent. Practice this during your kata training.